Chinta Air have bases located at Adelaide, Ceduna, Rawnsley Park Station in the Flinders Ranges, (during the winter months) at Nullarbor Roadhouse, and (during the summer months) on Kangaroo Island (Kingscote). In addition, Chinta Air is licenced to fly anywhere in Australia, and up to 200 nautical miles offshore, so please do not hesitate to ask for details. Lake Eyre is Australia’s largest salt lake, and lies in the remote NE of South Australia. The best way to experience the true majesty of Lake Eyre / Kati Thanda National Park is from the air. Kangaroo Island is an Island located to the South of Adelaide. Over 150kms wide, and nearly 70 kilometres from top to bottom, Kangaroo Island is world-renowned for coastal scenery, and native Australian wildlife in the wild. During summer, Chinta Air offers scenic flights from Kangaroo Island (Kingscote) Airport. Chinta Air Tours offers a range of air charter flights, an air taxi service and extended air tours. Destinations include: The wildlife of Kangaroo Island. The seafood of the Lower Eyre Peninsula and Port Lincoln. The Flinders Ranges, with scenery that has inspired painters and poets for generations. Coober Pedy, the Opal Capital of the World. Uluru and Kata Tjuta – the Red Centre. Nullarbor Roadhouse is the starting point for flights along the Bunda Cliffs from the Head of Bight to Eucla. Also the Mysteries of Maralinga make a fascinating flight option. From mid-May to early October, Southern Right Whales gather in the Great Australian Bight Marine Park to give birth, to socialise, and to breed. Rawnsley Park Station is famous for its dramatic scenery, ancient mountain ranges, rich Aboriginal heritage, abundant native wildlife and traditional country towns. 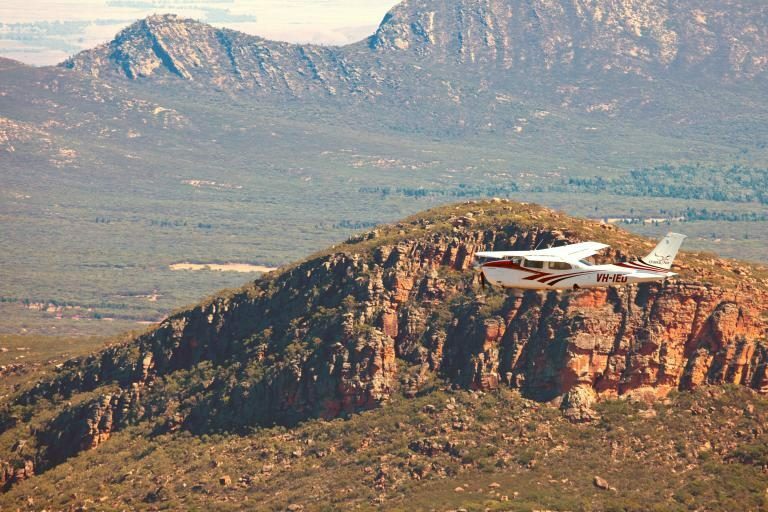 The Flinders Ranges offers visitors a taste of the Australian Outback within a comfortable drive of a capital city, making it ideal for short breaks as well as longer stays. Ceduna is a town of nearly 2000 people, located 770 kilometres West of Adelaide on Highway One. Scenic highlights include pristine beaches and coastal waterways, while to the North lies the sand dunes and scrub lands of Yellabinna Regional Reserve. Chinta Air offers an Air Taxi / Air Charter service. This operates like an Uber of the Air – you tell us where and when you wish to travel, and we take you there. All flights operate as private charter flights, with departures on demand, to the destination of your choice. Please contact us for a quote.